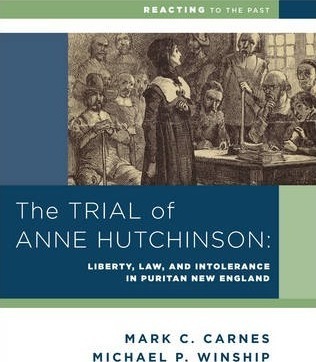 The Trial of Anne Hutchinson re-creates one of the most tumultuous and significant episodes in early American history: the struggle between the followers and allies of John Winthrop, governor of the Massachusetts Bay Colony, and those of Anne Hutchinson, a strong-willed and brilliant religious dissenter. The controversy pushed Massachusetts to the brink of collapse and spurred a significant exodus. The Puritans who founded Massachusetts were poised between the Middle Ages and the modern world, and in many ways, they helped to bring the modern world into being. The Trial of Anne Hutchinson plunges participants into a religious world that will be unfamiliar to many of them. Yet the Puritans' passionate struggles over how far they could tolerate a diversity of religious opinions in a colony committed to religious unity were part of a larger historical process that led to religious freedom and the modern concept of separation of church and state. Their vehement commitment to their liberties and fears about the many threats these faced were passed down to the American Revolution and beyond. Michael P. Winship is E. Merton Coulter Professor of History at the University of Georgia. Winship is the author of the highly acclaimed Making Heretics: Militant Protestantism and Free Grace in Massachusetts, 1636-1641, the definitive study of Hutchinson and the controversies around her, as well as a briefer version of the episode, The Times and Trials of Anne Hutchinson: Puritans Divided. Mark C. Carnes is professor of history at Barnard College and creator of Reacting to the Past. He is the author of many books in American history and general editor of the 26-volume American National Biography, published by the ACLS and Oxford University Press.